Tourism – Clachan in Kintyre, Argyll, Scotland. Clachan in Kintyre, Argyll, Scotland. The road from the west end of Glasgow takes the motorist along the banks of Loch Lomond until it divides at Tarbet, where the A83 turns off to the left and heads towards Inverary, Lochgilphead and Tarbert. 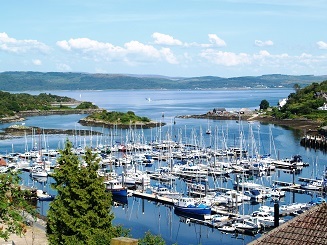 The route is very scenic and full of interest, running alongside lochs, through glens, and in the shadow of towering mountains, until finally arriving at the head of Kintyre, Tarbert, the fishing village and yachting marina. Here there is a plentiful choice of shops, catering for every day needs or the special items to remind visitors of their stay. Alternatively there are several ferries which sail to the peninsula, and which sail from Kintyre to the nearby islands of Islay, Gigha and Arran. Caledonian MacBrayne offer various ticketing arrangements, details of which can be found on their website www.calmac.co.uk, together with timetables, prices and routes. The island of Gigha was the subject of a community buy-out in the early years of this century, and is a popular day trip by ferry from Tayinloan, to saunter along the single road and possibly enjoy the delights of Achamore Gardens, The Boathouse Restaurant, The Gigha Gallery or The Gigha Hotel, to name just a few. And to show your friends and families elsewhere what a delightful place this is, you will find a selection of gift cards displaying photographic views of the island. Islay is well-known as the home of a number of distilleries, producing several famous and much-loved peaty or smokey malt whiskies. Aficionados of ‘the water of life’ will spend a long day on a pilgrimage from one location to the next, until they are carried home on the last boat back to Kennacraig. From Port Askaig on the eastern edge of Islay there is a small vehicle ferry that crosses over to Jura, another island well-know for its world-wide export. The name Jura means the island of deer, red deer, which greatly out-number the inhabitants of the island. The Paps of Jura, the distinctive granitic mountains, are landmarks visible from miles around. Campbeltown, towards the southern tip of Kintyre, was founded in the early years of the seventeenth century by the seventh Earl of Argyll, and has a busy harbour and yacht marina. The coal mining industry here has long-since disappeared, and of the several small whisky distilleries just two remain, and offer first class tours celebrating the traditional Scottish drink. ‘The Wee Toon’ is blossoming in the twenty-first century, with its new library and aqualibrium, coffee shops, bars and hotels. To the extreme south lies Dunaverty, with a view of not only the Mull of Kintyre, but, on a fine day, the coast of Northern Ireland some twelve miles across the water. To the west of Campbeltown is Machrihanish, with its two fine golf courses and the airport, which offers flights to and from Glasgow International Airport. 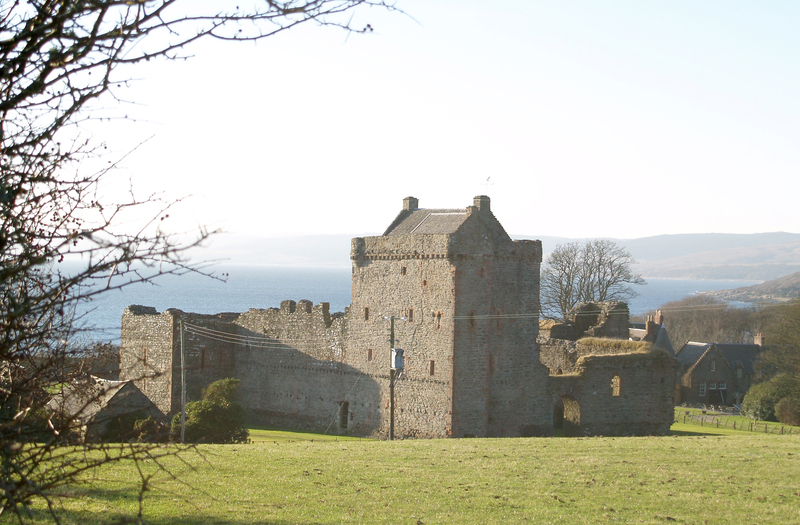 The road running up the eastern side of Kintyre passes by Saddell Castle and the ruins of Saddell Abbey, until it reaches the village of Carradale. After that the way becomes single track, but soon opens out to reveal the dramatic peaks of the island of Arran across the Kilbrannan Sound, some six miles away, reached by ferry during the summer months from Cloanaig. Finally the road leads to Skipness, a small settlement with an ancient castle, ruined chapel, a shop and post office. Back to Claonaig and the road winds over the hillsides until it meets the A83 not far from the ferry terminal at Kennacraig.